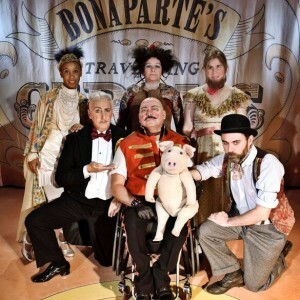 Bonaparte’s travelling circus, show and marvellous menagerie was on its uppers. A zoo with just pigeons, an aerialist who won’t leave the ground, a chipped plate spinning act, and a Mr Memory who can hardly remember his own name. And then into their lives came Edmund the Learned Pig. Based upon a poem by Edward Gorey this magical entertainment cunningly fuses BSL, puppets, music by Martyn Jacques of the Tiger Lillies and circus to create a darkly pleasant feast of a show that will tickle the palettes of grown-ups and young shavers alike.